Club Runs: On most Sundays throughout the year for all ages and abilities. Routes are carefully planned, using quiet roads and "lanes" where possible, with Cafe stops on longer runs. PLEASE NOTE THAT THE CLUB RUN START TIMES ARE NOW 9 A.M. FROM THE GATE ONLY. Sunday the 31st. of March, Nostell Priory, 9.00 a.m. from the Gate, 9.30 a.m. Hickleton. Sunday the 7th. of April, Idle Valley, Retford, 9.00 a.m. from the Gate. Sunday the 14th of April, Cridling Stubbs, Blue Lagoon, 9.00 a.m. from the Gate, 9.30 a.m. Hickleton. Easter Sunday the 21st. of April, Oldcoates, 9.00 a.m. from the Gate. Sunday the 28th. of April, Yorkshire Sculpture Park, West Bretton, 9.00 a.m. from the Gate. GROUP BEHAVIOUR: The Sunday Run is a social event not a race. Obey the rules of the road and maintain a civil approach to the public including drivers. Each rider of the group is individually responsible for his/her own safety but the ride will be safer and more enjoyable if the actions of other riders can be more easily predicted, for this reason our club has a riding etiquette. All regular riders on the Club Run should be aware of this code of conduct and help “newbies” by informing them and showing them the ropes. RULES OF THE ROAD: Traffic lights – Red, amber and red/amber all mean stop. None come with an “except cyclists” exclusion. Keep left signs and bollards – it means exactly what they say, keep left. Stop signs at junctions – Don’t have a quick glance then sprint across, this endangers riders and drivers and the chances are the rest of the group will have to stop and you will only end up waiting for them. GROUP STRUCTURE: No more than two abreast and single file on busy or narrow roads. Ride in pairs in line with the pair in front, no nearer than half a metre. Do not “half wheel” the rider in front of you as a touch of wheels could bring several riders down also single out when necessary. Don't echelon and spread across the road as this appears to be 3 and 4 abreast to vehicles approaching from the rear. More difficult to single out and negotiate road junctions. Confuses motorists particularly when cutting back in after overtaking. The Club strongly advises that large groups should split into smaller groups. “On the left” obstacle on the left e.g. parked car, pedestrian etc. call often accompanied by placing the left arm behind the back. “Hole” warning of a hole in the road, the call is accompanied by pointing to the obstacle, this shout can be adjusted to suit other obstacles such as branches, horse droppings, bricks etc. “Easy” slow down and pay attention, this could be for a hazard, the group breaking up etc. “Stopping” is self explanatory but avoid sudden braking and bunching up. When changing direction let other riders know with a warning that is both verbal and visual. Concentrate just the same as you should when driving a car and anticipate! Be aware of road conditions and assess probability of incidents, read the road, the pros do. Adjust riding to suit, adjust pace, gaps between riders and one or two abreast. On blind bends and crests of hills, if you can't see on-coming traffic don't assume there isn't any. It has already been mentioned that stop signs should be obeyed. Groups should remain orderly and avoid bunching at the mouth of the junction. Riders who have negotiated the junction, should check whether others had to wait, if so ride at a speed where they can re-join quickly. Riders on the inside should in turn slightly accelerate to allow riders on the outside to in turn slip in behind them. The instinctive reaction to an oncoming car is to brake. The braking severity increases through the group, makes singling out difficult and may take riders down. Avoid it if possible. GOING TO THE FRONT: In a group of similar ability riders, it seems only fair that all members of the group should take a turn at the front, particularly when the group is riding into a strong wind etc. However, in groups with less able riders or riders experiencing problems it is totally acceptable for them to opt out of a turn on the front and for stronger riders to work for the good of the group on the front. Clearly tell the group that there is to be a change at the front. The rider on the outside at the front accelerates and moves over in front of the nearside rider. The outside riders then move up one and the last rider on the inside will move to the outside to reform into pairs. This gives everyone in the group an opportunity to converse with each other. Avoid bunching and riding more than 2 abreast. When standing on the pedals maintain an even pace by pushing harder on the initial stroke, slowing has the perceived effect of moving backwards into the rider behind and can cause collisions. Be aware that others may not be too skilled at the above and leave space where possible. When descending the right line obviously helps but not at the expense of safety, the wrong side of the road on blind bends is unacceptable. It's not a road race on closed roads, your luck will run out one day and causing a car to swerve is putting the driver and your club-mates at risk. The above notes are only a guide to making the Club Run safe for everyone. Please remember that you are responsible for your own actions which may impact on other members of the group. 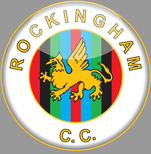 PLEASE NOTE: Rockingham C.C. cannot accept any responsibility for accidents to riders or third parties. Anyone attending a Club Run do so at their own risk. It's been a while since my last ride with a cycling club. Lack of any fitness and a gain in weight has put me off joining up with a club for the Sunday morning ride for many years. So this Sunday I took the plunge. Getting the bike from the garage and doing all the checks of cuts in the tyres, gears indexing correctly and some drink in my bottle I set off for the meeting point at The Gate in Swinton. Twenty past nine and no one is here, have I got the right place, am I going to last five minutes on this ride or will I be OK........I could slope off quick before anyone arrives.............NO NO............lets see it out and see where I am fitness wise. Five riders turn up and here we are. Chatting about life in general and the previous nights club prize giving do the few minutes pass to nine thirty and that's it........WE'RE OFF. Down the hill and out onto the country lanes we are moving along nicely at 16-17mph. On my own 13-14mph is manageable but in a pack of riders and protected from the wind cycling is so much easier. Staying close to the riders on the front I find myself free wheeling more than I'm pedalling. You know what, I'm going to be OK.
We reach the top and that's it. The last hill of the day. We meet up with some other riders and now there is nine of us. I decide to stay near the front when we set off again. If I'm here, I'm OK. If I'm at the back and start to struggle I will get dropped and slow them down...........We cant have that now can we. Looking at my computer we have covered twenty miles, oh now twenty five...............now nearly thirty miles, this is easy. Lovelyroads and scenery to look at and the time is just passing away. LOVE THIS. Riding two abreast I am meeting different riders as people move up and down the pack. Its all going fine. Thirty two miles and I need a stop, Don't want to hold everyone up so I decide to stop and let them carry on back. After a nice hot chocolate its fifteen miles to get home for me. Now this was my only bad idea of the day. On my own in struggling to get over 13mph. Wind in my face and starting to feel the miles in my legs I press on..........this is hurting now. Home at last. Legs hurt and my bike is filthy......49 miles on my computer. WOW............loved it, well the first 35 miles anyway. Will I go again, YES..............nice people, nice chat and riding more miles than I would on my own and I'm still alive. So why do I see riders struggling around the lanes on their own. Join your local cycling club. Don't worry about being fat and unfit. You will be fine. Clubs have rides for different abilities and will look after you. And its much more fun than being on your own. Road Trip to Loch Erribol. Just to let you know I set off to ride to our Mikes on Sunday morning.I had a lad with me first day Keith Fox the husband of one of Julia's friends we rode to Leyburn above West Tanfield where we watched the tour 77 miles his wife drove up to take him home and to bring my panniers up that was a great help as I've found out today.The weather turned from very good yesterday to horrendous today heavy rain and wind for most of today I am in a b n b in Carlisle at mo and going to ring mike to get an idea of weather for next few days to see whether to carry on or catch train.Anyway think I will carry on tomorrow as it's a decent forecast for the morning at least anyway 154 miles done on computer up to now. Cheers, John. Tuesday morning decent weather, left Carlisle heading for south of Hamilton near Glasgow, booked in at Catch Guest House. Got a bit lost leaving Carlisle trying to find road at the side of the Motorway. Entered Scotland on side road near Gretna. Long haul over Beatock Summit that afternoon, made it to Hamilton, 83 miles. Next day planning to get round Glasgow, set off 9 a.m. in built up areas all morning but got to Stirling mid afternoon, decided to push on to Perth, got there early evening, 76 miles. The forecast for the next few days not good, decided to call it a day and catch train to Inverness where Michael Jnr. picked me up, DISSAPOINTED not to finish the ride but weather and weight of panniers did me! Still 311 MILES DONE! Cheers, John. Club Run notes, by Ian Ambler and others. After the recent spell of bad weather it was good to get out on a dry day. A decent turn out of eight, Andy, Ala, Rob, Oliver, Dave & Ant set off from The Gate and collected Dave & Bullet at Hickleton. Into a very cold and tough head wind we headed out thro' Hooten Pagnall, South Elmsall, Hemsworth, Ackworth, where Dave peeled off, East Hardwick to Darrington where we picked up a most welcome tailwind to Womersley, Norton, Campsall, Sutton, Owston and into Carcroft. The final 10 miles or so back thro' Woodlands, Brodsworth, Hickleton back into the wind! A tough but very enjoyable ride. Click on the link to view details of the Club Run on Sunday the 22nd. of February. Click on the link to view details of the Club Run on Sunday the 1st. of February. Click on the link to view details of the Club Run on Sunday the 9th. of November. Click on the link to view details of the Club Run on Sunday the 31st. of August. Click on the link to view details of 'Stage Two Revisited' Club Run on Sunday the 13th. of July. Click on the link to view details of the Tour De France Club Run on Sunday the 6th. of July. Click on the link to view details of the 'A' Club Run on Sunday the 30th. of March. Click on the link to view details of the 'B' Club Run on Sunday the 30th. of March. Click on the link to view details of the Club Run on Sunday the 23rd. of March. Click on the link to view details of the Club Run on Sunday the 10th. of March. Club run on Sunday the 10th. of March. Eleven Club members and one (name unknown) turned up at the Gate on what was forecast to be the best day of the year so far. Ian Brears, Sam Hunter, Pat Pearce, Oliver Potter, Rob Cooke, Dave Andrews, 'Bullet' Bisby, D.C., Ant plus one set off on the latest 'Teacake Run' to the High Peak, with Andy Whitehead and Alla Jackson opting for the 'A' run heading in the opposite direction to Hickleton. On reaching Wentworth the first incident occured, a puncture for Sam, swiftly dealt with by a new inner tube and a blast from his air cannister. After climbing thro' Thorpe Hesley, on the descent towards Chapletown, the first to peel off was Ian who unfortunately had to return to go to work! The next to leave early was Pat after the climb to Grenoside but that wasn't the last we would see of him. The next mishap involved Oliver who managed to get caught up in the Tram lines as we approached Hilsborough. How on earth he managed to stay upright was a miracle! We got going again after a few minutes for Oliver to stop shaking and see to his shipped chain. Through Wadsley Bridge avoiding the Tram lines and left onto the bottom of Rivelin Valley when half way up we lost one (name unknown) with front changer/bottom bracket problems when changing into lower gears. Luckily he knew a local resident so no doubt he was fed and watered whilst waiting for his lift home. The long slog up Rivelin kept everyone quiet and looking forward to the descent to Ladybower. A right turn and over the cattle grid along Derwent Valley to the VERY popular 'Honey pot' the Visitors Centre at Fairholmes where much needed sustenance was enjoyed by all! After a few conversations with other day trippers and a quick photo we set off with Rob and Sam blissfully unaware of what was to come. As we climbed away from Ladybower and turned left onto 'THE STRINES' and after all the build up for the two 'Strines virgins' a 'Road Closed' sign blocked our path. Not to dissapoint Rob and Sam we decided to give it a go. The Strines Pub was open for business but after that the road was closed and virtually traffic free as workmen were installing new crash barriers. As we climbed out of the second hairpin we were well strung out when an approaching motor cyclist offered familiar encouragement. Pat Pearce with Deb on pillion enjoying a Sunday afternoon jaunt on his 'Alter Ego'. The final two hair pins managed to halt the progress with one or two of us stopping for a breather before regrouping over the top and the hairy descent into Midhopestones. Before this last killer climb we missed Neil who 'got lost' and turned off to Bolsterstone and ended up riding back with a B.R.C. member. A right turn onto Stocksbridge bypass and the long ascent to Tankersley Manor, onto the D.V.P. at Birdwell to Manvers completed a very tough 4 hrs. plus and approximately 60 miles in the saddle on a glorious Spring day. Club run on Sunday the 2nd. of March. A wet start and a poor forecast may have persuaded a few not to turn out this morning and as I arrived at the Gate only Oliver Potter and Sam Hunter, joining us for the first time, were waiting. Just as the three of us had decided to set off for Hickleton Andy Whitehead and Ala Jackson approached from Golden Smithies. A quick turn around for them and a chance to enjoy the freewheel back down to Manvers! The climb up to Hickleton through Barnburgh never gets any easier and as we approached the crossroads we were surprised to see no one waiting, then we spotted a small group on the right side of the road. A Tandem and a solo asked if they could come along for the ride. Ron with Debbie stoking on the Tandem set off at a cracking pace passing everyone up the hill and then settled down once we all caught up, with Ken tucked in at the back! By the time we had reached Brodsworth the route had been more or less decided, Adwick, Carcroft, Burghwallis, Campsall, Norton, thro' to Womersley, Darrington then Carleton, where the Tandem duo and Ken tucked in at the back! turned to East Hardwick as the rest of us carried on into a tough cross-headwind to Wentbridge and Badsworth where a choice had to be made, do we go left to Upton, South Elmsall and the stiff climb into Hooten Pagnall? Or do we go right into Badsworth village, onto Hemsworth bypass and Park Springs? We decided to go right for more miles rather than the climb which in hindsight may not have been the best choice as we got onto the bypass into a full on headwind! As we were halfway along Park Springs a moron in a car thought it was a good idea to overtake a line of cars approaching us head on, the ever vigilant Andy saw the danger and forced us into the side of the road avoiding what could have been something serious! The next couple of miles passed with us discussing if's and maybe's. When we reached Darfield roundabout I split from the group as they continued on the D.V.P. to Manvers and back to Swinton. All in all a good run of around 45 miles. Click on the link to view details of the Club Run on Sunday the 2nd. of March. Club run on Sunday the 23rd of February. just a summary of sunday's tom simpson memorial ride,i'm too tired to write anymore !! me, Neil Trench Andrew Whitehead Ala Jackson Ian Brears and Rob Cooke left harworth at 10am behind 200 fast lads, myself and ian brears on the front, 24mph headwind to retford lovely 30mile tailwind through gringley on the hill, misterton and owston ferry. Then the hell !! 10 mile cross headwind through belton and onto hatfield at which point i took a break from the front and Ian brears and rob cooke took to the brunt of the headwind for the final 10 mile through Blaxton, finningley and bawtry to take us back to Harworth. A very hard ride in very strong wind. Kudos to Ian Brears who led from the front for the whole 56 mile. Club run on Sunday the 16th of February. The weather forecast was as good as it`s been for a while so it was no surprise that 15 club members and guests congregated at hicky cross roads. It was decided that two runs, A and B, would be the order of the day with John McNamara leading the 'B' group consisting of Andy Whitehead, Ala Jackson, Dave Gregg, Diane and John Spencer and Neil Bisby on a flat run to Blyth and Oldcoates garden centre cafe. The 'A' team of me, Ian Brears, Neil Trench, Oliver Potter, Dave Cook, Rob Cooke, Dominic Crookes and Visitor from Sheffield James Gibson headed off into the gloom towards Hooton Pagnell before climbing up to Clayton. As we from Clayton towards Brierley the weather forecast was proved wrong and the heavens opened. Just as we turned onto Southmoor Road a cry went out from behind as Neil Bisby (having a change of heart) used his recent speed training to join the A team from the B group. Brierley, Shafton and Old Royston soon passed but it wasn't until we hit Notton until the rain stopped. The climbing started soon after through Woolley and up to Woolley edge before a welcome 40mph descent into Haigh. Having reached the bottom first i had a surprise as there wasn't anyone behind me due, thankfully, to an unshipped chain. This minor mechanical was soon fixed and we made our way under the M1 and turned onto Jebb Lane and the longest and steepest climb of the day. I and Neil Trench led the way but were soon passed by DC and more surprisingly Rob Cooke doing the best Zigzags of the day. Up and up we went as the team became more stretched along the hill. Relief soon came as we took a break to regroup. High Hoyland was next and this is where the rain decided to make another appearance so we stopped to cape up. A lovely long decent down to Cannon Hall was the reward for the climb up Jebb lane. Silkstone flew by before Silkstone common, Dodworth and Stainborough passed as we enjoyed the tailwind and loss of altitude. Legs were getting tired as we came to Worsbrough and headed towards home via Wombwell Wood. Rob was the first to leave the A team peleton, well, we did pass his house, before we split at Hemingfield. Myself, Dominic, Neil Bisby and Neil Trench headed down past Cortonwood before splitting at West Melton to head our separate way home. Meanwhile, DC, Oliver, James and Ian decide that they hadn't had enough climbing and made their way back to Swinton via Elsecar and Wentworth. A good introduction to the hills was enjoyed by all. Club run on Sunday the 2nd of February. On a sunny but cold february sunday 12 members, myself, Andy Whithead, Ala Jackson, Des Robinson, Diane and John Spencer, Dave Cook, Rob Cooke, Neil Bisby, Neil Trench, Dave Gregg and finally the return after a long injury layoff Ant McNamara set off at 1005 am on the club run from the additional meeting point of the crown pub in harlington having arrived via the usual meeting points of the gate and hickleton cross roads. The ride started with the climb up to high melton, myself and Diane had the same idea of starting the climb at the front in the hope that we would soon end up at the back, alas, it was not to be and we had the front all to ourselves through to Sprotborough Falls where diane was replaced at the head by her hubby John. The chat and banter was flowing well as we went through Warmsworth, Balby and Wadworth. As we headed towards Tickhill a pothole produced the first of the days punctures for Neil Trench. After a short stop to fix the puncture we carried on but just a few hundred yards down the road the new inner tube decided it wasn't upto the job and we stopped again to change the tube again. On we pushed but we had not even left Tickhill before Neil Bisby got in on the flat tyre front and we stopped again. At this point it was decided that we would split and Neil Trench, Rob Cooke and Ant Mc stayed with Neil. This Group then headed at Ant's Pace (see Garmin file) around the outskirts of Doncaster to Barnby Dun before returning via Bentley, Cusworth and Mexborough. After the split Des, Diane and John pushed on for a longer run and went out to Blyth via Serlby and The Bell hotel before taking the direct route back via Styrrup. Myself, Andy, Ala, Dc and Dave Gregg headed to Harworth before turning towards Styrrup and battling the rising cross headwind we headed through the lanes to Stainton before dropping down into Conisbrough and Mexborough before splitting and heading home. All in all a good ride but spoilt a little by the cyclists curse of punctures. Click on the link below to view details from Sunday 25th of August, Sherburn in Elmet. 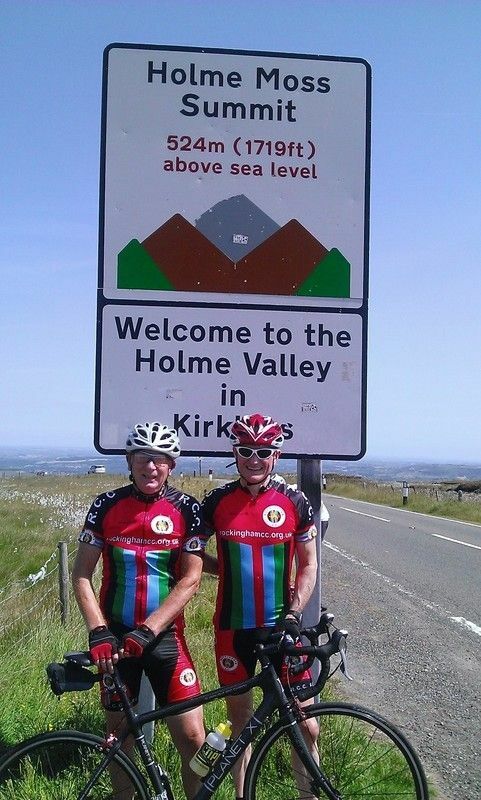 Click on the link below to view details from Sunday 7th of July, Holme Moss. THE MEETING POINT FOR TRAINING IS MANVERS ROUNDABOUT, LEAVING AT 6 P.M. PROMPT. Training: For racing members starts in February until October on Tuesdays and Thursdays. . First few sessions will be steady tempo gradually increasing speed & distance as the nights get lighter. Good lights are essential and wear some hi-viz clothing if possible. Make sure you are self sufficient, if you puncture the group will carry on (unless someone offers to assist) and pick you up on the return leg. Remember we are Training TOGETHER not Racing EACH OTHER!